The Devil is the fifteenth Major Arcana of the Tarot. 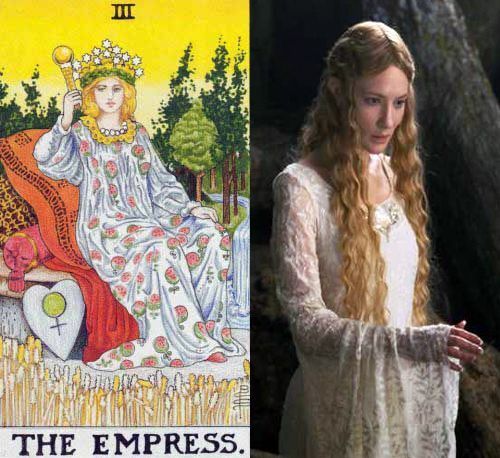 There are some differences between the Devil’s image in Tarot of Marseilles and Rider Waite tarot. That’s because A. E. Waite was influenced by another French occultist – Eliphas Levi, author of the famous illustration „Baphomet“ in his book „Dogme et Rituel de la Haute Magie“. 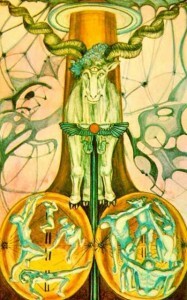 This illustration largely influences the Devil, as it is depicted in Rider-Waite tarot deck. 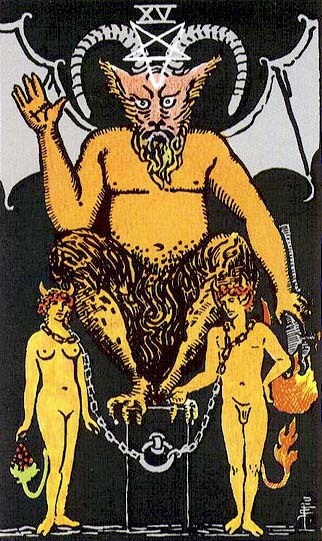 We’ll see how the Devil is interpreted by four important masters of tarot: A. E. Waite, P. D. Ouspensky, Aleister Crowley and Papus. 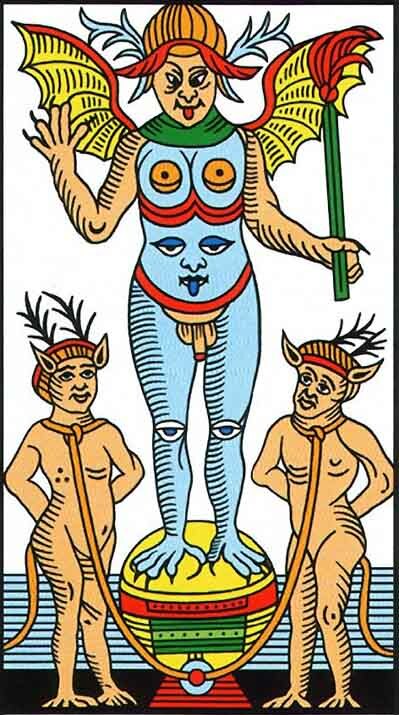 When speaking about the divinatory meaning of the Greater Arcana, Waite offers this list of possible meanings, for the Devil: „ravage, violence, vehemence, extraordinary efforts, force, fatality; that which is predestined but is not for this reason evil“. Reversed, the Devil can signify: „evil fatality, weakness, pettiness, blindness“. 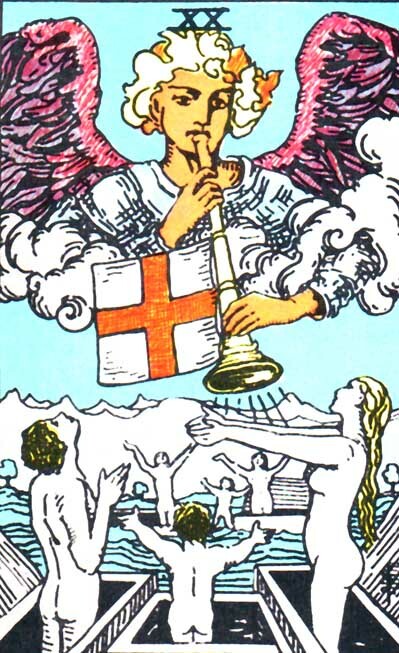 In his chapter about the doctrine behind the veil, Waite affirms that the Baphometic figure represented in this card is „the Dweller on the Threshold without the Mystical Garden when those are driven forth therefrom who have eaten the forbidden fruit“. Waite also indicates the analogies between this Major Arcana and The Lovers: „These [male and female figures] are analogous with those of the fifth card, as if Adam and Eve after the Fall. Hereof is the chain and fatality of the material life“. Ouspensky also notes the similarity between the Lovers and the two human figures represented in this card: „ A man and woman were chained to the cube–the same Man and Woman I saw in the garden, but now they had horns and tails tipped with flame. And they were evidently dissatisfied in spirit, and were filled with protest and repulsion“. The mysterious Voice offers the explanation for their current state: „This is a picture of weakness, a picture of falsehood and evil. They are the same man and woman you saw in the garden, but their love ceasing to be a sacrifice, became an illusion. This man and woman forgot that their love is a link in the chain that unites them with eternity, that their love is a symbol of equilibrium and a road to Infinity. They forgot that It is a key to the gate of the magic world, the torch which lights the higher Path. They forgot that Love is real and immortal and they subjugated it to the unreal and temporary. And they each made love a tool for submitting the other to himself. Then love became dissension and fettered them with iron chains to the black cube of matter, on which sits deceit“. The Devil himself explains his status and his actions: „ I am Evil, at least so far as Evil can exist in this best of worlds. In order to see me, one must be able to see unfairly, incorrectly and narrowly. I close the triangle, the other two sides of which are Death and Time. In order to quit this triangle it is necessary to see that it does not exist. But how to do this is not for me to tell. For I am the Evil which men say is the cause of all evil and which they invented as an excuse for all the evil that they do. They call me the Prince of Falsehood, and truly I am the prince of lies, because I am the most monstrous production of human lies“. Aleister Crowley connects the Devil with the Hebrew letter Ayin and with the zodiac sign of Capricorn. „This card represents creative energy in its most material form; in the Zodiac, Capricornus occupies the Zenith. It is the most exalted of the signs; it is the goat leaping with lust upon the summits of earth. 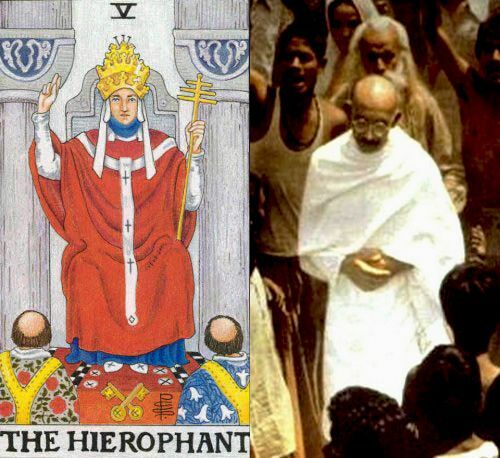 The sign is ruled by Saturn, who makes for selfhood and perpetuity“. „The formula of this card is then the complete appreciation of all existing things. He rejoices in the rugged and the barren no less than in the smooth and the fertile. All things equally exalt him. He represents the finding of ecstasy in every phenomenon, however naturally repugnant; he transcends all limitations; he is Pan; he is All“. „ A little attentive consideration of the symbol will show us that it contains several of the details which we have already seen in other figures of the Tarot, but under a different aspect. The 3rd arcanum symbolizes the Holy Spirit, or the Providence of Fabre d’Olivet. The 15th arcanum symbolizes the False Spirit, or the Destiny of Fabre d’Olivet. The 9th arcanum, which fills the centre between the two figures, symbolizes Prudence, or the Human Will of Fabre d’Olivet. The Devil has materialized upon his head the universal fluid which surrounded the head of the Juggler; this is indicated by the two six-pointed horns which adorn him“. FATALITY, the result of the fall of Adam-Eve. The astral fluid, which individualizes. Share the post "The Devil – Major Arcana Tarot Card Meaning, according to Waite, Ouspensky, Crowley and Papus"